I was blessed to have supportive family members who offered to be living donors for me. 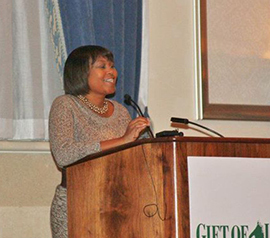 Pontiac, MI – Andrea Spraggins was only nine when she was diagnosed with Type 1 diabetes. Her kidneys failed when she was 19, and she was on peritoneal dialysis for two-and-a-half years before she decided to consider kidney transplant as a treatment option. 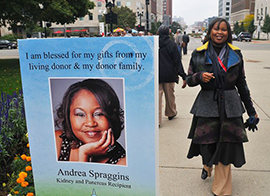 “I was blessed to have supportive family members who offered to be living donors for me when I began dialysis,” said Andrea. “However, I decided to remain strong and do daily peritoneal exchanges because I feared for their safety,” In 1994, at age 22, Andrea finally decided to allow her parents and sister to be tested. “What really helped me to finally make the decision to consider transplant as a treatment option was speaking to an actual transplant recipient,” recalled Andrea. Her mother, Jerry Kay Clark, was the most compatible kidney donor match, and the surgery was a success. Andrea is now free from taking insulin injections. Andrea’s speedy recovery after her kidney transplant allowed her to return to college at Wayne State University in Detroit. 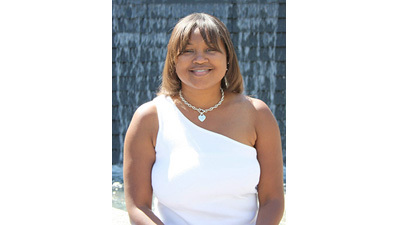 After receiving her BA in Social Work, she obtained her Masters in Social Work in 10 months and received a Dean’s scholarship.